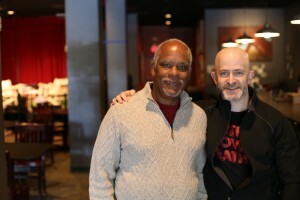 I met with director Stanley Nelson on Sunday, May 7, 2017, at the Maryland Film Festival, to discuss his latest documentary, Tell Them We Are Rising: The Story of Black Colleges and Universities, which premiered at Sundance (when I reviewed it). As the title suggests, the movie tells the important history of our nation’s Historically Black Colleges and Universities (HBCUs). In today’s political climate, it is an especially urgent tale. Here is a condensed digest of our conversation. Hammer to Nail: Stanley, Black Panthers: Vanguard of the Revolution just came out in 2015, and now this. Were you working on the two films simultaneously? That’s an amazing one-two punch. Stanley Nelson: (laughs) Yeah, unfortunately I was working on both at the same time. What happened was that we knew we were going to do both films, so we were raising the money for Tell Them We Are Rising while we were producing Panthers, and then Panthers had such a long roll-out, because we were supposed to be in 8 cities and we ended up in 60. So we started production of Tell Them We Are Rising while we were doing the roll-out of Panthers. HtN: So, just recently, there have been articles about how the Trump administration may be trying to look at the constitutionality of funding for HBCUs. Your reaction? Would you consider adding an addendum to your film about that? SN: No, I don’t think we’re going to add an addendum to the film, because I’m not sure where this is all going to end up, and things are constantly changing and evolving, and who knows where we’ll be when the film airs in February of 2018, on PBS. My reaction is pretty much the same as to almost anything Trump has done, you know – he’s uninformed, there’s no historical background to anything that he does, he does whatever he’s in the mood for at any given moment – but I think, adding it all up, that the Trump administration is very dangerous to so many things in this country that we’ve held dear and which have been a bedrock of our lives. I think he’s dangerous to HBCUs. We’ll see. What they’re saying is that funding anything that’s race-based or religion-based is unconstitutional. It doesn’t make any sense. Like so many things he does, it’s not really thought out. HtN: Irrespective of the Trump administration, you do discuss the future of HBCUs. Now that you’ve made this film, what do you think that future holds? SN: Well, there’s about 105 HBCUs that exist now. Certainly, I think that, in the near future – 20 or 30 years form now – there will be less. Who knows? 80? 70? Whatever. Hopefully, there will be a consolidation of some of the schools. I think that will happen. I think that some of the schools are actually seeing an uptick in enrollment and in applications. They call it the “Missouri Effect,” for what happened in Missouri, and young African-Americans feeling like they want a safe space, you know, a safe intellectual space, that they don’t have in majority-white institutions. And so I think that until racism ends in this country and we have a level playing field – that’s not based on race – we’re going to need HBCUs. We seem to be getting further from that promised land than closer, for now. HtN: Yes, indeed. It’s a very different feeling in 2017 than in 2008, 2009. Moving on. I really like how you set up the fundamental opposition in the early efforts to offer education to our country’s African-American population: the Booker T. Washington/W.E.B. DuBois polarity. How much of that did you already know, and how much did you learn in making your film? SN: Going in to make the film, I knew a bit about Washington and DuBois. I felt that this was one of the real turning points in African-American education. We also thought that one of the reasons why it was so interesting was that Booker T. Washington was the President of Tuskegee – a black institution – but he was also the most powerful black man in the United States. And that was really fascinating, that in the 1890s or so, the most powerful black man in the United States was the head of a black college. And that was a story that we had to tell. HtN: Indeed. It’s always interesting to consider alternative histories. As far as the making of your film goes, you have great talking-head interviews. How did you assemble your cast of experts? SN: Just from looking around and talking to as many people as we possibly could, trying to find the best and most passionate people for the film. In a film like this, where the first half of the film or so is up to 1920, we don’t have living witnesses, so there we’re looking for historians who can talk with passion, who can talk like they were there and tell stories, who can really make history come alive. Anybody who’s had a great history teacher in school knows that that’s possible. It really is possible. And then once we got into the 30s and 40s, we were really just looking for a cast of characters, almost like you’re casting a feature film. You’re looking for people who are good, and passionate and funny. We’re always looking for humor! That makes a big difference. I make films that a lot of times are about very serious subjects, so I’m always looking for ways that we can put a little humor in there. HtN: Sure, to leaven the mood. Did anyone say no? Was there anyone you really wanted who couldn’t, or wouldn’t, be in the film? SN: No. Not really. There was one guy, however, who will go nameless, who we loved – he’s kind of a public intellectual – and we just couldn’t get him. And we were doing our final interviews, believe it or not last September and October and November, and we were in the middle of the election season, and he has a deal with one of the networks, as a pundit, and we just couldn’t pin him down to get the interview. So that was someone we really wanted, and couldn’t get, but in no way did it make or break the film. HtN: Final question: filmmakers and others from outside Baltimore seem to really like the Maryland Film Festival a lot. This is not your first time here. Why do you think people like the festival so much? SN: There are a number of reasons this festival is great. Number one: I think the audiences are great. I really like Baltimore. And I taught at Morgan [State University] for a while. HtN: But you’re originally from New York. SN: Yes. I’m originally from New York. Also, the people at the Maryland Film Festival treat you very well. They’re just really nice people. There’s not that kind of edge that you get at other – I won’t name them – film festivals. (laughs) It’s just more of a relaxed feeling. You get a lot of people here who just want to see films. Like, we showed the film last night, at 7:30, and there was another film afterwards, at 10, and I noticed that people who had gone to my screening were on line for the next film. I forget what it was – it was a fiction film – but it had nothing to do with the subject of my film! They were just seeing films. You know, that’s what you want. The more you can show films to real people and get a real reaction and interact with the audience doing these great Q&A’s. That’s what you want. HtN: Well, thank you very much. Congratulations on the film.